Our cause here at Dorseygor Press USconstitutions is to have a more informed citizenry, public and voter. Too many of our institutions, media outlets and schools no longer inform us about the ideas of America's founders. So it becomes our responsibility as Americans to pass along the values of a free society spelled out in our founding documents. 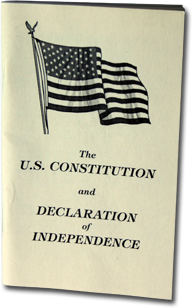 To that end we offer the Pocket Constitution, information links to your state constitution and links to the major political party platforms. Follow this link to StateConstitution.com to read your states' constitution. Be an informed voter. Republican, Democrat, Libertarian - Know what they stand for, know what they believe.